The Disney adaptation of Stephen Sondheim and James Lapine's musical Into the Woods is currently being shot in the UK with images from the set being leaked via social media and news outlets yesterday. Here are shots taken at Dover Castle where they are filming Cinderella's wedding with Anna Kendrick and Chris Pine as Cinderella and her Prince. 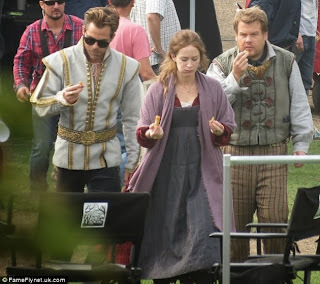 Also is an off camera shot of James Corden as the Baker.